Hi everyone. Gosh, it's been forever since I have done a blog post. Ugh!! Been in NY now for over a month and am enjoying my time here. I have been staying mostly at my BFF Sue's house (thank God for BFFs) and also some nights at my friend Justin's place. And I have been putting in some time at both The Ink Pad and at my friend Renee's new store on Long Island called Scrap-A-Latte. Of course, no matter where I am staying, I tend to lug with me a bag of supplies but have yet to truly find the time to make anything. But today, that changed. I worked at The Ink Pad all day yesterday and Justin drove in with me. He was supposed to hang out with me until Barbara showed up but ended up hanging with me all day. Sally Field stopped into the store yesterday, which made my heart go a-flutter, and I got to have dinner with Barbara, Jane, and Justin down in the village last night. A great day and a great night. I stayed over at Justin's and, since he was making a card for one of his challenges today, I decided to dig into my bag of tricks and make a quick one too. A few week's ago Justin and I got over to The Moon Rose, a store that closed about 10 years ago but has just reopened - in Huntington, NY! It was great to meet Diana Kovacs for the first time ever and we hung out for more than a bit talking. 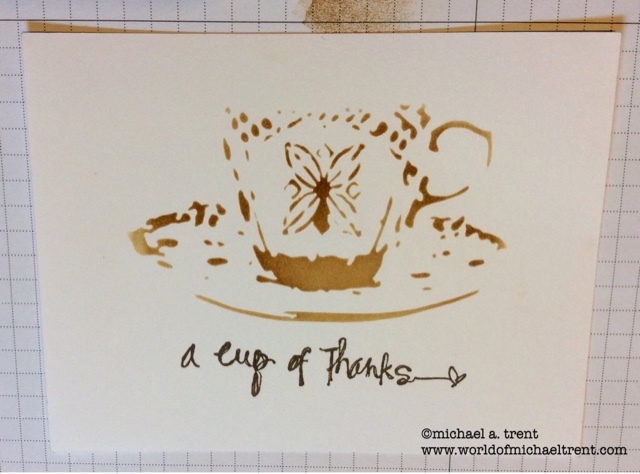 While there I saw this cute little stencil of a tea cup and this card idea immediately popped into my head. It is sooooo easy to make. I cut a piece of white cardstock 4" x 5.25". Adhered the stencil in center with Micropore tape. 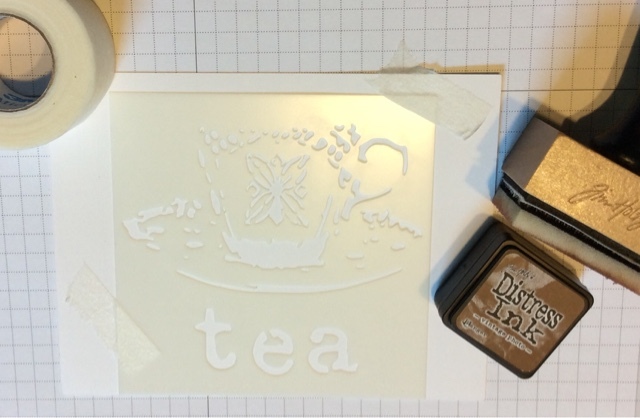 Then, using Tim Holtz's Vintage Photo Distress Ink with an applicator, I blended the ink through the stencil onto the white cardstock. 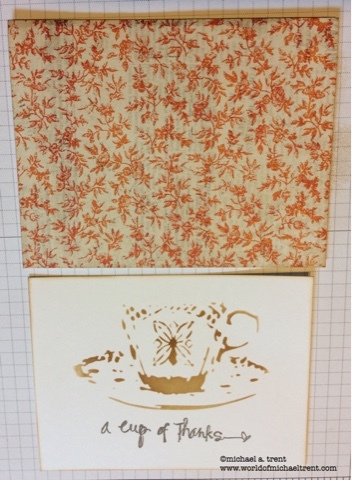 Then I stamped the phrase in the Chocolate Brown section from the Ombre - Sand to Chocolate Brown ink pad by Hero Arts. Cut my card base out of 110lb Neenah Solar White A2 size. I then found a beautiful piece of cardstock from the Bella Rouge Collection by Prima Marketing (the Melange sheet) and cut a piece 4.25" x 5.5" and adhered this to my card base front. 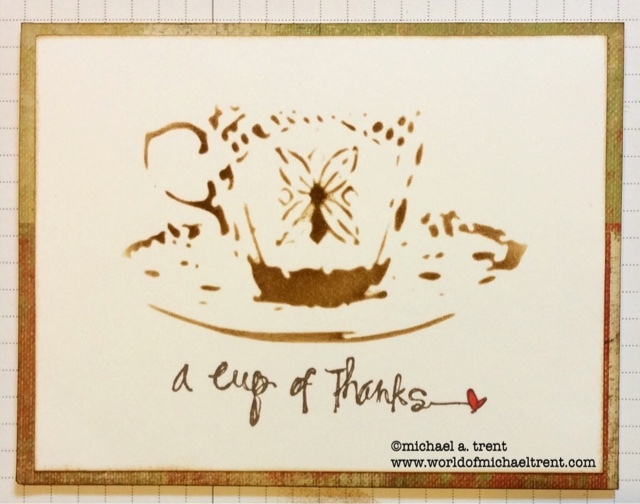 Distressed the edges of both the card base and my white cardstock with Vintage Photo and then adhered the white cardstock with the cup of tea to the card front. That's it!! Can it get any easier? 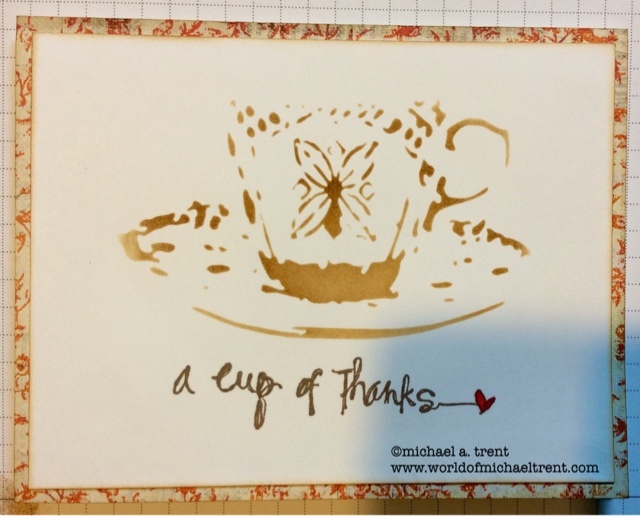 Here is the same card but I flipped the stencil over so it would be for a left-handed person and then adhered it to the same paper but the reverse side. Hope you enjoyed this post. 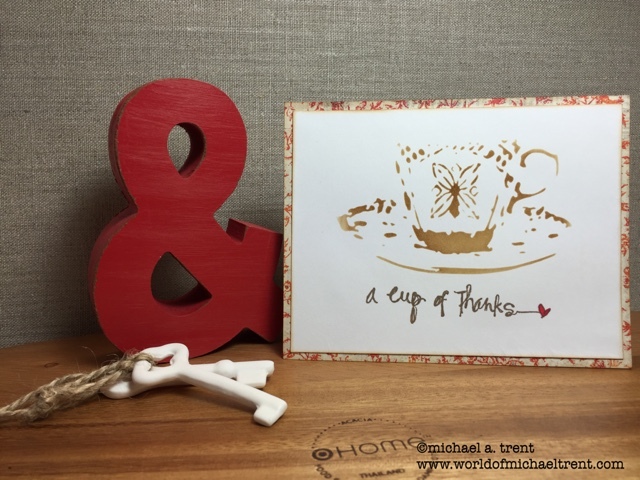 Feels good to have made a card and cannot wait to make the next one! !